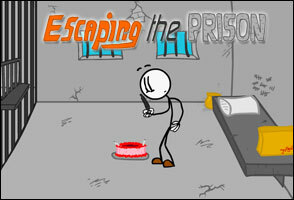 Escaping the Prison is an unusual and original Room Escape game from Puffballs United. You will have to think and act fast in this excellent game. Prepare yourself to fail: you can die while trying to escape the prison, and die you will! Found all three; not too hard! Cute game…..if one could call it a game…..
-When in court, select the bag and present it as evidence. -REFLEXES: Click the left side of the screen to take out that guard, but then one will come from the right, click there as well. -In the next room, select the chair. -In the vent shaft, go right. -On the roof, select the plungers. -In the locker room, select the crowbar. -REFLEXES: First option, go down. Second option, go left. -MEGA-REFLEX: After 5 “Get Ready”s, the click button is at the bottom of the screen. Matrix time! 5.make sure u click plungers the rest DO NOT WORK trust me tried ! thats for the sneaky ending hope it helps ! i know the secret ending it is oh no not u ahhh dont kill me call help ahhhhhhhhhh!!! on the sneaky ending, click on the sun………. Posted on Monday, April 12th, 2010. Follow any responses through the RSS 2.0 feed.